Porsche 356 was Porsche’s first production autombile; a sportscard produced in 1948-1965. Roughly half of the circa 76,000 cars produced have survived into our time and they are now highly collectible, especially when maintained in good condition, with some selling for over 100,000 USD at auctions. Among the most expensive are versions produced in small numbers, such as the Carrera Speedster with the DOHC racing engine. The Porsche 356 is a lightweight and nimble 2-door car, with rear-wheel drive and the engine placed in the back. It was made in two main versions: hardtop coupé and cabriolet. When first launched in 1948, the hardtop coupé cost $3,750 in the United States and the cabriolet $4,250. Production started in 1948 and continued until April 1965, which was well after the replacement model 911 had made its debut. Throughout its long production period, the Porsche 356 was continously improved in various ways, keeping it current and desirable among buyers of new sportscars. It enjoyed plenty of success in rallys and races, both as close to stock and in more modified versions. In the early 1960s, Porsche collaborated with the Italian car maker Abarth to create the highly capable Porsche 365B Carrera GTL Abarth coupé. How many Porsche 356 cars were produced? 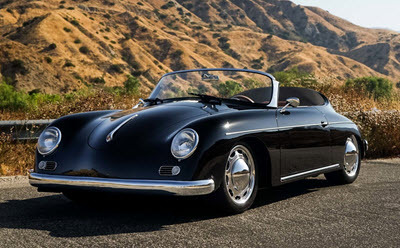 The Porsche 356 is considered Porsche’s first production automobile. They created automobiles earlier than this, but only in very limited numbers. Only three Type 64 cars made for the 1939 Berlin-to-Rome race (which was cancelled. The Porsche 356 prototype called No. 1, created by Ferdinand “Ferry” Porsche, was completed in 1948. It was a smooth and low two-seater open roadster with a tubular chassis. The engine was a mid-mounted air-cooled flat-4 1,131 cc engine capable of producing 40 hp (30 kW). The aluminium body of the Porsche 365/1 was a new design by Erwin Komenda, while much of the mechanics – including engine case and some of the suspension – were derived from the Volkswagen Beetle, a car designed by Ferry’s father, the founder of the Porsche car company. The prototype was registered in the state Kärnten och got the license plate number K45-286. It went on its first road voyage on June 8, 1948. Soon after, it won a race in Innsbruck, Austria. Today, 356/1 is on display in the Porsche Museum in Stuttgart, Germany. When production of the Porsche 356 started, one important change had been made. While the prototype was mid-engined, the production car had its engine behind the rear axle. This change was implemented to reduce costs and create room for two additional seats. Production commenced at Gmünd in Austria in 1948, where roughly 50 cars were built before production relocated to Zuffenhausen, Germany in 1950. The 356 cars made in Gmünd had aluminium bodies, but the factory in Zuffenhausen used steel bodies instead. The steel bodies were made by an independent company called Reutter. In 1963, the body-producing part of Reutter was purchased by Porsche, and the remaining part of Reutter changed name to Recaro. During the first few years, the Porsche 356 wasn’t a well-known car, especially not outside Austria and Germany. Eventually, car enthusiasts in other countries, including the United States, began to take notice, and Porsche’s class win at Le Mans in 1951 helped a great deal. Throughout the production years, Porsche improved the 356 in various ways, and used fewer and fewer parts from the Volkswagen. In late 1954, the four-cam racing Carrera engine became available as an extra-cost option when buying a Porsche 356A. This engine was a completely new design and only used for Porsche sports cars. In the early 1960s, Porsche increased success in racing events garnered a lot of positive publicity for the brand, and in 1964 their recieved orders for over 10,000 units. Both the coupés and the soft-tops (cabriolets) had split windows from 1948 to 1952. After this, they had bent (centre-creased) windscreens. This car, with its curved windshield, first appeared in late 1955. The T5 356B was launched in late 1959, followed by T6 in 1962. It was fairly similar to the late T6 356 B cars, but with some notable changes, including disc brakes instead of drums. The 365 had an air-cooled pushrod OHV flat-four engine that Porsche built around the egine case originally designed for the Volkswagen Beetle. To make it more powerful, Porsche added new cylinder heads, camshaft, crankshaft, intake and exhaust manifolds. They also put in dual carburetors. The result was an engine capable of producing more than twice the horsepower of the one in the Volkswagen Bettle. In 1955, the four-cam Carrera engine was introduced for the Porsche 356A, but only as an extra-cost option.